The elegant, clean, architectural lines of our Straight, Curve and Contempo benches are excellent seating solutions for a wide variety of applications. The smallest 32" bench accommodates 1 adult or 2 children comfortably and our largest 72" bench accommodates 3 adults or about 4 children comfortably. The Bench & Planter Combos with their distinctive open 2" x 2" bench seat are accented with redwood planter boxes at the ends. We hand select every board and the bench seats are secured from below to create a beautifully smooth surface that highlights the natural beauty of the wood. Our furniture is designed and hand built at our store in Northern New Mexico. 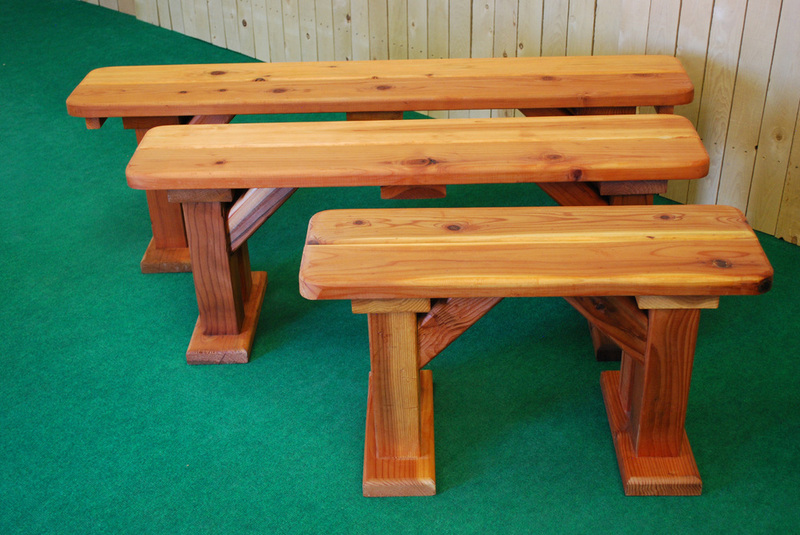 Beautiful and functional, our benches are designed for timeless style and durability. The bench seats are 2" x 6" redwood and the legs are 4" x 4" redwood on the Straight, Curved and Contempo benches. The Bench & Planter Combos constructed with 2" x 2" redwood bench seats and 18" planter box ends. All benches are assembled with zinc coated screws for strength and durability. Ships fully assembled and securely shrink wrapped on a pallet via enclosed container truck to residential or commercial addresses in the continental USA. Visit our friendly, family-owned showroom. For local purchases, we load your purchase in your vehicle and offer delivery throughout the Four Corners area. Call for local pricing. Contact us or visit our q & a page for additional information. We do custom design work. Our experienced staff is ready to answer your questions and provide guidance.